The Auspit Australian Rotisserie BBQ looks to amp up the inevitable creative combinations by allowing for food to be stuck on a spit anywhere there is fire. Just stake the Auspit into the ground and slide your meal onto the spit. 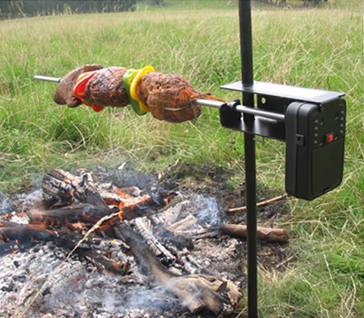 Running on two D-cell batteries, the portable rotisserie slowly turns the food while you enjoy the scenery. An available accessory, the Spitmate is a steel cage drum that is to be used for cooking smaller items such as chicken wings, nuts or even breads and rolls. With all the possibilities this inspires, your camp grub can be taken to a whole new level. No more looking for that perfect branch to roast the wieners. Instead, you can be cooking whole chickens over an open fire. Let the possibilities begin. Has the turducken equivalent of chicken, hot dogs and trail mix been invented yet?